Join us on Wednesday, May 23, 2018 for an informative and enlightening presentation by Dr. John Jackson, a world-renowned expert on the Shroud of Turin. 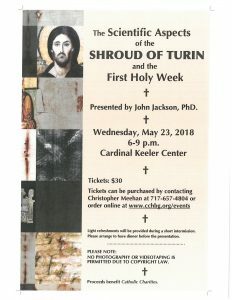 In 1978, when interest in the Shroud was at its height, Dr. Jackson led a 40-person team of international scientists to Turin where they, under the auspices of the Shroud of Turin Research Project (STURP), examined the Shroud for nearly a week. No one since that time has secured such full scientific research access to the cloth. Significant amounts of different scientific data were extracted. Dr. Jackson became the primary custodian of this data and, along with his scientific colleagues in Colorado, he has continued the thrust of Shroud research. In addition to Dr. Jackson’s presentation, the evening includes a reception with light refreshments during intermission. Proceeds from the event will benefit Catholic Charities. For more information or to purchase a ticket, contact Christopher Meehan, Catholic Charities Director of Development, at 717-657-4804 extension 284. Tickets can also be purchased online by clicking the link below.